Service: 442nd Signal Battalion and 82nd Airborne - Pacific, North Africa and Europe - 1st and 2nd World War. 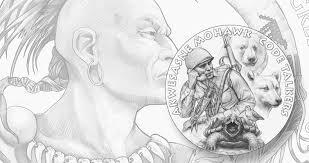 Mohawks from New York State and Ontario served as Code Talkers. There were two different teams of Mohawk code talkers. One in the 442nd Signal Battalion reportedly served in the Pacific. The other team, in the 82nd Airborne Division, served in North Africa, Italy, France, Holland, Belgium and Germany.